So I've pretty much decided that this Spring/Summer I wanna look like some kind of explosion in a My Little Pony Factory - I am in love with everything pastel: the pinks, the lilacs, the blues, and the mint greens and I'm not sure how well this will work, but I want to dip dye my hair again! 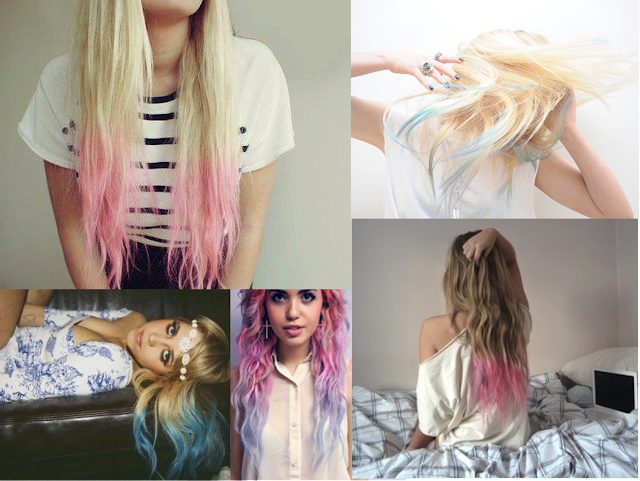 I just need your help (if I may) ...pink or blue? I love both, I'm probably swaying more towards pink at the moment because I don't really wear pink tops so it won't look too matchy matchy with my clothes....but arrrghh I keep changing my mind! Pink. Pink is best colour! Make everything PINK! everyone does pink! do BLUEE or mint green! i can't decide. maybe pink! loving your blog! Try pink... you only live once! btw, I've only ever had Red hair and love being a redhead! I like the pink! Love this idea, I think it works so well. i love your blog and started to follow you :) maybe you'll have a look on my blog also, dear! now following as your blog is awsome! awww love the pics <3 I would try pink! why don't you try something in the middle? that would be a great dip dye color, too!! I think if I had to choose between pink and blue, I would choose pink if I had blonde hair like you, but I might also consider a really, really pale blue, or a violet, or maybe even a minty green? I saw someone with green once and it looked so cool!